The New York State Department of Environmental Conservation (NYSDEC) has recently reported that cyanobacteria (also known as blue-green algae) have exceeded bloom criteria in Hook Pond in the Town of East Hampton. Photo by: Scott Bunker, via Free Images. 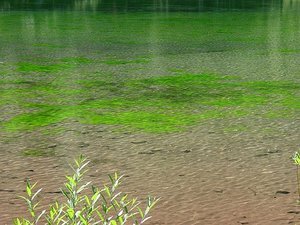 East Hampton, NY - September 11, 2015 - The New York State Department of Environmental Conservation (NYSDEC) has recently reported that cyanobacteria (also known as blue-green algae) have exceeded bloom criteria in Hook Pond in the Town of East Hampton. To report a suspected cyanobacteria bloom that is in a body of water that lies within Suffolk County but does not contain a Suffolk County permitted bathing beach, contact the Division of Water at New York State Department of Environmental Conservation: (518) 402-8179. Subject: LongIsland.com - Your Name sent you Article details of "Health Officials Warn of Cyanobacteria Bloom on Hook Pond in East Hampton"